Sometimes the signs are subtle when you are heading towards burnout. But, if you ignore the signs, you might be headed straight towards a serious crash. Learn to pay attention to the warning signs and you may steer clear of the wreckage that awaits. 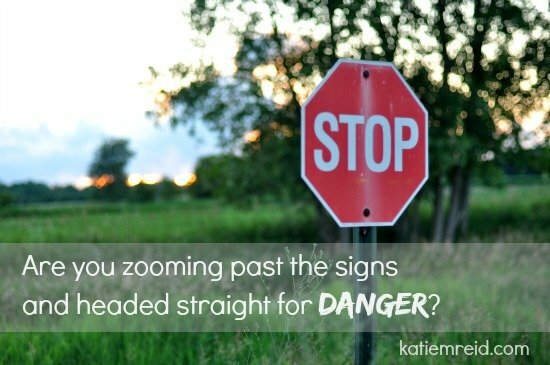 Yield signs may come in the form of loved ones commenting (or confronting) that you need to slow down and rest. Is your body flashing a yellow light, reminding you to paying attention to what your body needs? Are you sacrificing your well-being—like eating well, sleeping enough, and exercising—because you are hyper-focused on the task at hand? Do you have foggy-brain and trouble focusing on anything else apart from your latest project? Do you miss the yield signs because you aren’t even looking up long enough to see them as you speed by? Almost a year ago I hit a wall physically. I had been speeding towards my goals—going to bed late and getting up early, repeat, repeat, repeat. I was obsessed with arriving at a certain place by a certain time, so I clocked in hour after hour trying to make it happen, fast. I was more concerned about the destination than the journey. I was trying to make things happen by controlling the speedometer. I was irritable and had difficulty sleeping. I was striving and driving and was surprised when I ran out of gas. I was forced to pull over and wasn’t sure when I’d be back on the road to my dreams again. « To Defend or Not Defend? Wow I totally empathize with you there 😛 I’m a crazy perfectionist as well and I’ve made myself push through burnout too, even though I really should have just taken the time to relax because it did NOT end well. It’s so important to see the warning signs! !